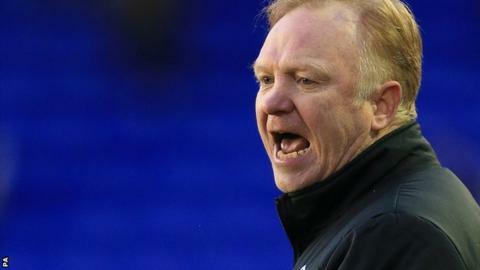 Nottingham Forest manager Alex McLeish refused to commit his future to the club after a 2-1 defeat by Birmingham. There has been speculation McLeish would resign after just over a month as boss following a transfer window in which he missed out on several targets. Chairman Fawaz Al Hasawi has said he has a good relationship with McLeish. But McLeish told BBC Radio Nottingham: "I'm not going to make any comment. I'm going to talk about the team and game. I'm only talking about football." A deadline-day deal for George Boyd fell through in unusual circumstances, while to add insult to injury, another target Chris Burke scored both goals in Birmingham's win at St Andrew's. "We know he is a good player and capable of doing that," McLeish added. "I'm disappointed we didn't get the deals over the line. Today it haunted us badly. "It's disappointing that we went so far and it didn't happen but that's the frustrations of the transfer window."